When we look under rocks or logs, we almost always find ants. We have developed a special interest in the small, yellowish ones, particularly those that build large, solid mounds in swampy places. These ants are usually species in the genus “Lasius”. In this genus, each antenna has 12 segments (counting the straight section). Viewed from the side, the back has a stepped appearance, the rear part (the propodeum) being sharply lower than the forward part. 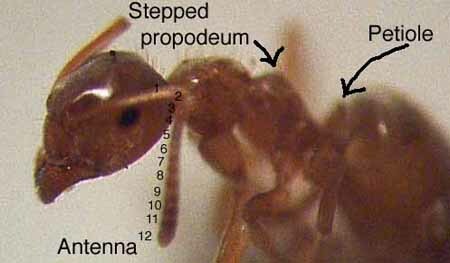 Compared with other similar ants, the surface of the propodeum is also quite short on top and much longer sloping downward. Lasius ants have one scale-like node (the petiole) between what are commonly thought of as the thorax and the abdomen (the alitrunk and the gaster). They do not sting, but have an acid pore fringed with hairs instead. Members of this genus are pretty common in our Study Area. We have identified a dozen species there, finding some species’ colonies under stones (like Lasius flavus), others in leaf litter, and our favourite, Lasius minutus, shown at right, in huge mounds that the ants build for themselves. The mound-builder is the one that we are studying. Its name is Lasius minutus. The features that distinguish its workers from those of other species are subtle differences in the size of the eyes and the lengths of the straight part of the antennae and palps, and the number of palp segments and their relative lengths. Identification is easier if the queens can be found with the workers. They are distinctly smaller than in other species, both in absolute size (4.5 mm long) and in relation to the workers (less than 1.5 times as long as a worker). Well established mounds are domes of very solid dark earth that rise as much as 32 inches (80 cm) and be as wide as 97 inches (245 cm)! Some of them appear to be very old, because they are covered with lichens and mosses. We have read that a queen of this species has been kept alive for at least 29 years in an entomology lab, so our mounds could well be several decades old. Like most other species in the genus, Lasius minutus is subterranean. It is so committed to living underground that it doesn’t even swarm to the surface in alarm when its mounds are disturbed. Like many ants, it looks after “herds” of aphids and feeds on their sweet honeydew secretions. Each colony protects its aphids from parasites and predators, and the workers move them about to best advantage. Lasius minutus does this all underground. 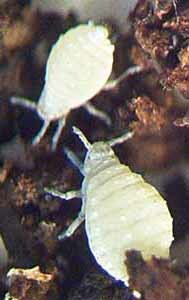 Its aphids, which are in the genus Prociphilus, draw sap from plant roots. 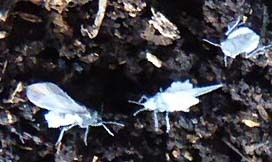 In most years we have found immatures, and immatures only, of these root aphids within the mounds just before winter arrives. The big event in each colony’s year is the launch of the reproductive generation they have spent the summer raising. We have seen that in late August, these reproductive members of the colony are brought to the top of the mound and kept for a time in new galleries just under the surface. When the time and the weather are right, the workers open large holes in the mound’s top and bring out the queens and drones. 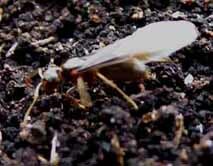 These ants, whose wings shine in the picture above left, take flight and disperse. Once they have left, the workers retreat inside again, but they leave the surface openings to show what has happened. In 2015, the ants had produced some winged queens and drones by late summer, but they seem to have kept them indoors, for we have been finding them just under the surface to the end of October. It seems an unlikely time of year to release them. In just two of a dozen mounds checked, we have also — for the first time in seven years — found small aggregations of winged root aphids. In our Study Area, these mounds occur across a quarter-mile of mixed swampy forest. Focusing on about one acre (50 x 80 metres) of fairly open, purely Black Ash swamp, we tagged the mounds and then mapped them with tape measure and compass. The results are shown just below. The labels are the initials of each mound’s discoverer. One can see that sometimes they are in groups of from three to five mounds. This suggests that these clusters are related in some way — probably each being a single colony with several interconnected mounds. How many mounds are there? There are about 50 mounds in the acre mapped above. Given the size of the swamp where they occur, there must be many, many hundreds. How many ants are there in a mound? Upon opening an average sized mound, we counted as many as we could and made a rough estimate of 10,000 workers. How long does it take the ants to build a big mound? 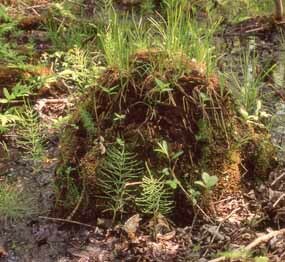 Macoun members have been seeing these ant mounds in the swamps since the early 1970s. But which ones? We only started tracking individual mounds in 2008. It’s too soon to say. The big question, the urgent one, is will the ant mounds survive the next couple of years? They depend on honeydew-producing root aphids that appear to feed on ash-tree roots, and the ashes are being wiped out by the invasive Emerald Ash Borer. The Borers have already killed many of the ash trees among the mounds. We will have to learn as much as we can by observation, by carefully measuring mounds, visiting at critical times, and even looking inside. Site developed in December 2009 and July 2010, based on fieldwork done in 2008, 2009, and updated in November 2015. All photos by Macoun Club members and leaders, past and present. Coding revised July 20, 2013 and May 12, 2016.